Jackson Hamilton skys for a transition layup. A second quarter surge by the Santa Barbara High boys basketball team overwhelmed visiting Dos Pueblos as the Dons captured a 84-57 victory in the Channel League opener for both teams on Wednesday night. 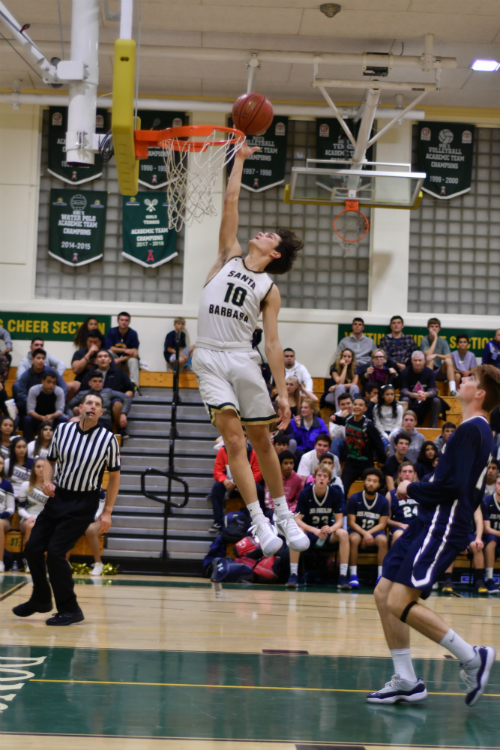 Bryce Warrecker was the focal point for Santa Barbara offensively and poured in a game-high 27 points while dominating the paint on both ends of the court. Warrecker connected on a three-pointer early in the first quarter that gave the Dons a 6-3 lead before piling up the majority of his points in the paint for the remainder of the game. 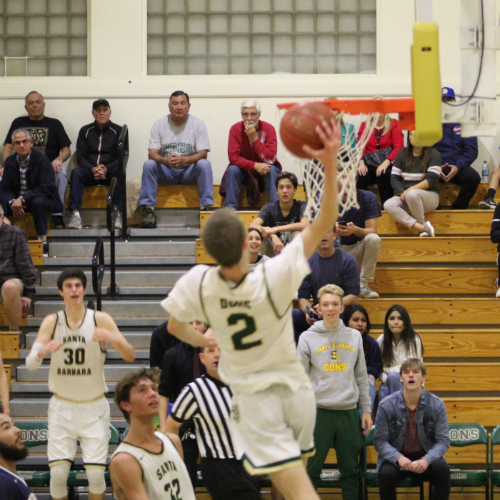 The Chargers cut their deficit to 10-9 on a basket by Andrew Guardino, but Santa Barbara responded with six straight points, capped off by a Jackson Hamilton layup that increased the lead to 16-9. A driving layup by Dos Pueblos point guard Jaron Rillie cut the Santa Barbara lead to 18-14, but Warreckers second three-pointer of the first quarter put the Dons ahead 21-14 heading into the second quarter. Dos Pueblos repeatedly turned the ball oHammever in the second quarter and Santa Barbara capitalized with baskets in transition. The Dons outscored the Chargers 22-10 in the second quarter to take a 43-24 lead into the locker room at half time. Rillie accounted for the bulk of the Dos Pueblos offense in the first half as he scored 16 points and the next highest scores for Dos Pueblos had three. Dos Pueblos coach Joe Zamora challenged other players to step up offensively and John Givens responded with 10 of his 13 points in the third quarter. The Chargers cut their deficit to 51-39 on Givens three-pointer midway through the third quarter, but once again Santa Barbara responded, this time with an 11-3 run capped off by a drop step and lay up by Warrecker that increased the Santa Barbara lead to 62-42. The Dons continued to push the pace in the fourth quarter and Jasper Johnson delivered to thunderous dunks in the closing minutes that brought the J.R. Richards Gymnasium crowd to its feet. Jasper Johnson throws down a powerful dunk in the fourth quarter against Dos Pueblos. Stephen Davis finished with 13 points for Santa Barbara while Aiden Douglas and Jackson Gonzalez chipped in ten points. Rillie paced Dos Pueblos with 23 points. With the victory Santa Barbara improved to 12-1 overall and 1-0 in Channel League play. Dos Pueblos dropped to 5-7 and 0-1 in Channel League.